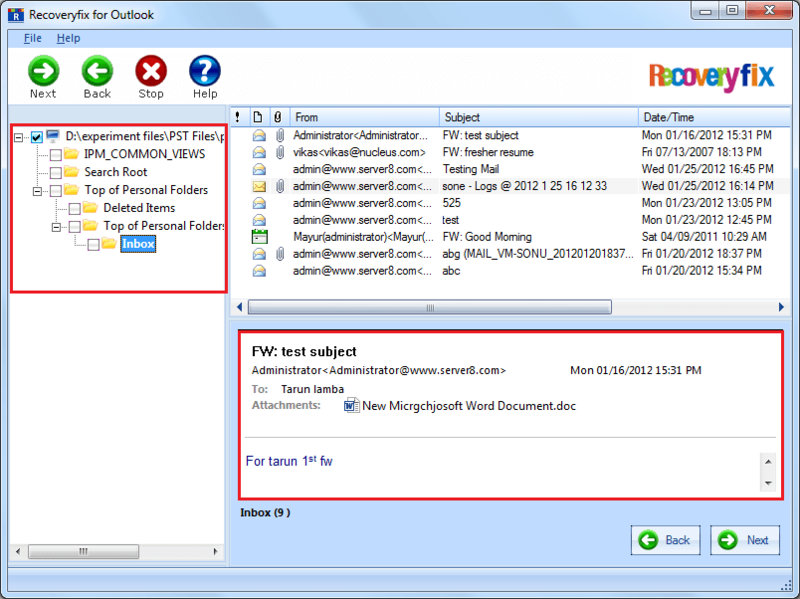 PST files or Personal Storage Table stores entire data of POP3 mail accounts configured in Outlook. MS Outlook allows users to send and receive emails, set up meetings, create notes and carry other important tasks. This continued usage of Outlook over the months or years creates a huge amount of data and hence the size of the PST files increases. Typically, the file size limit for PST and OST files is greater in Outlook 2010 and 2013 in comparison to earlier versions like Outlook 2007 and 2003. And the size of PST files is one of the reasons for these files getting damaged or corrupted. 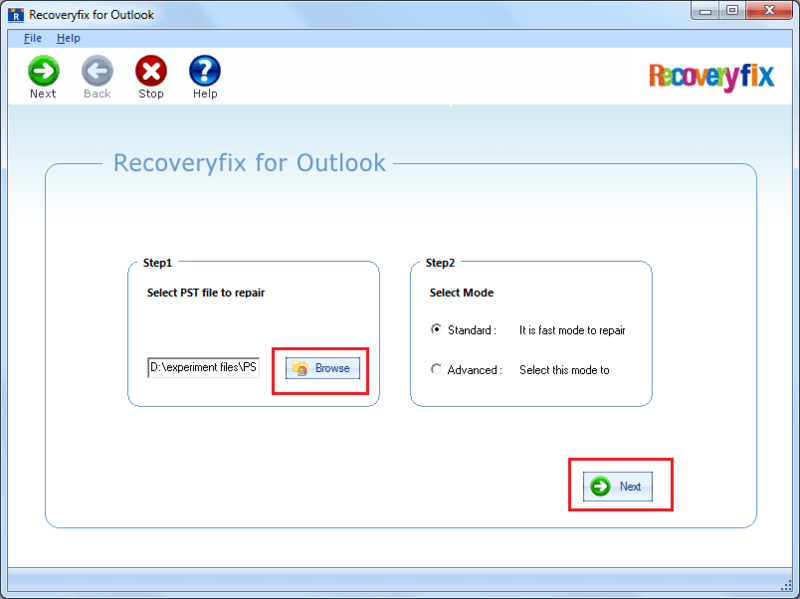 Download Recoveryfix for Outlook PST Repair and install the application on your computer. 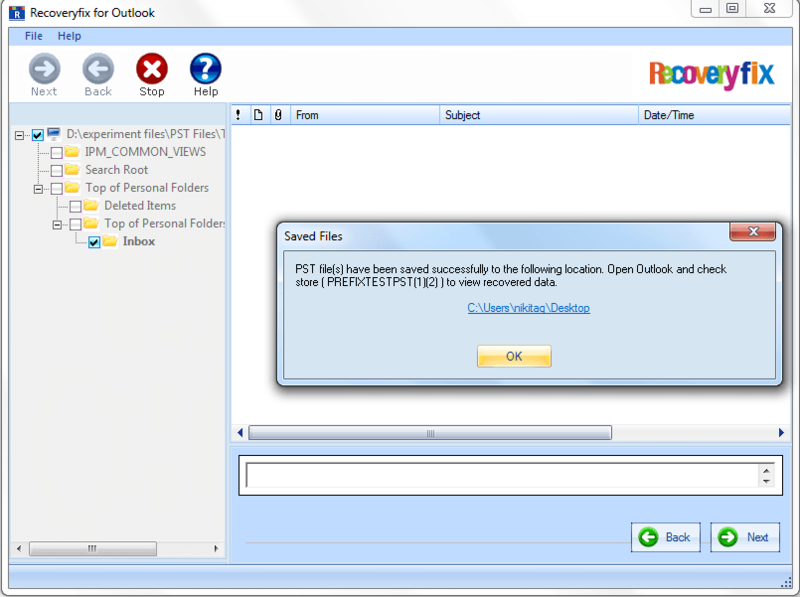 Launch Recoveryfix for Outlook PST Repair. From the left panel, select any folder for preview. This feature allows you to view entire mailbox items before final conversion. Click Next. In the saving window, the first option asks you to select the output type for saving the files. 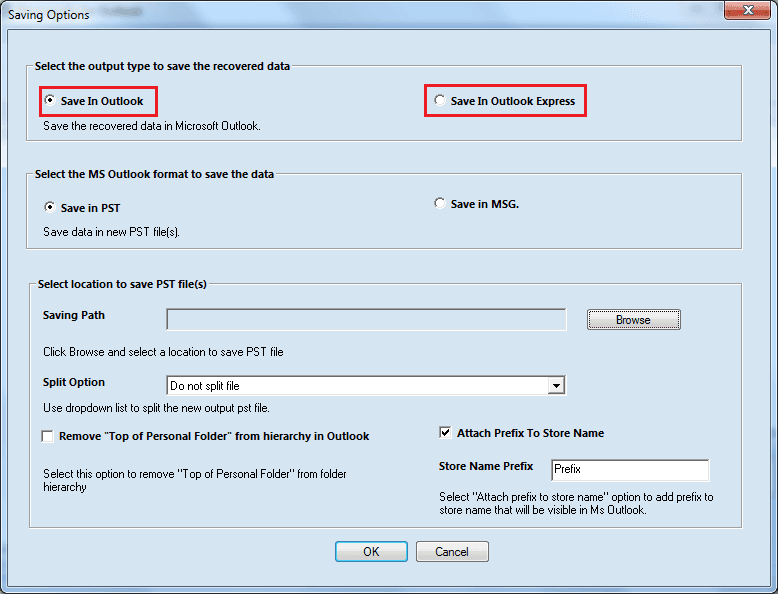 Select Save In Outlook to save in PST files. 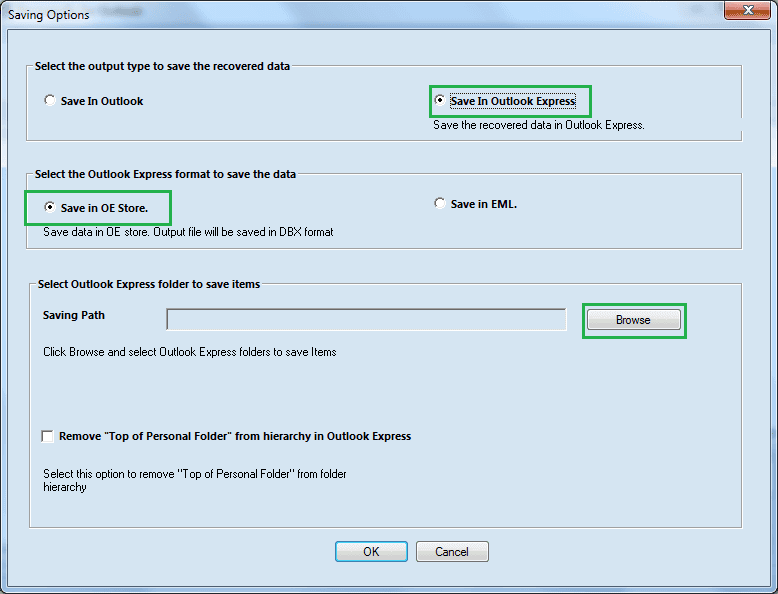 Note: To save the files in Outlook Express, select the Outlook Express checkbox which will further provide the option to save in 2 different formats, namely Save in OE Store and Save in EML. The first option is Save in OE Store where the files will be saved in DBX format. The other option is Save in EML option. In both the options, click on Browse button to select the location and select the checkbox if you want to remove top of personal folder form folder hierarchy. 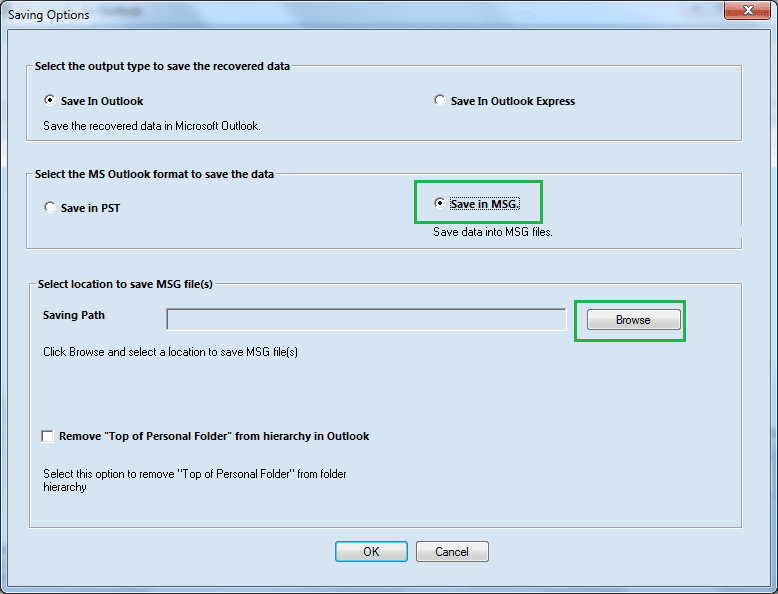 Save In Outlook provides saving option in two formats- Save in PST or Save in MSG. Select Save in PST. Click on Browse to select the location of the files. You can split large PST files into smaller divisions of 1 GB, 1.5 GB, 2 GB, 2.5 Gb, 3 GB and 3.5 GB. 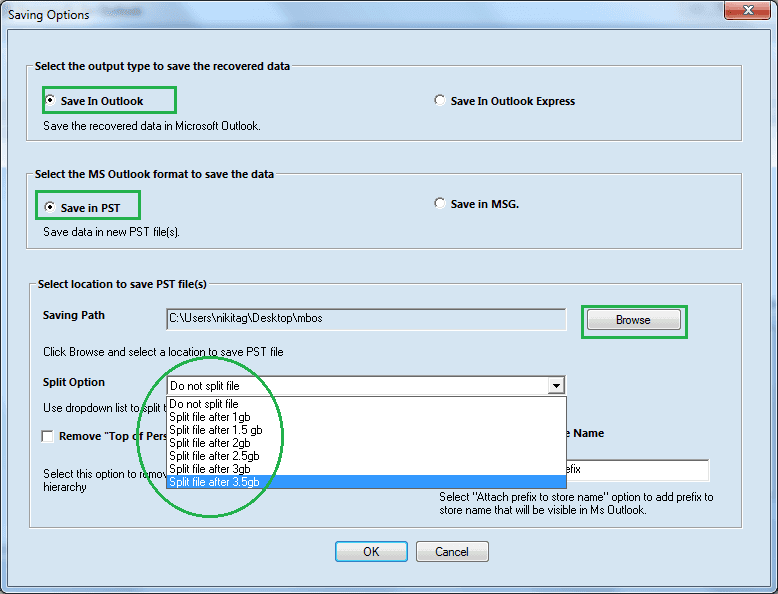 This option enables the files to be opened in older versions of Outlook where the allowed limit of PST files is 2 GB/4 GB. if you do not want any division then, select the option, Do not split file. Select the option, Remove ‘Top of Personal Folder’ from the hierarchy in Outlook if you want to remove the ‘top of personal folder’ from folder hierarchy. Select the option Attach Prefix To Store Name and provide a prefix if you want to add a prefix that will be evident in MS Outlook. Click OK. Note: Now, the other option is to select Save in MSG option, wherein you need to provide the saving path by browsing the saving location. After the successful repair, a message along with the saving location of the files will appear. To view the repaired files, you need to import them to Outlook. To view the repaired files, you need to import them to Outlook.